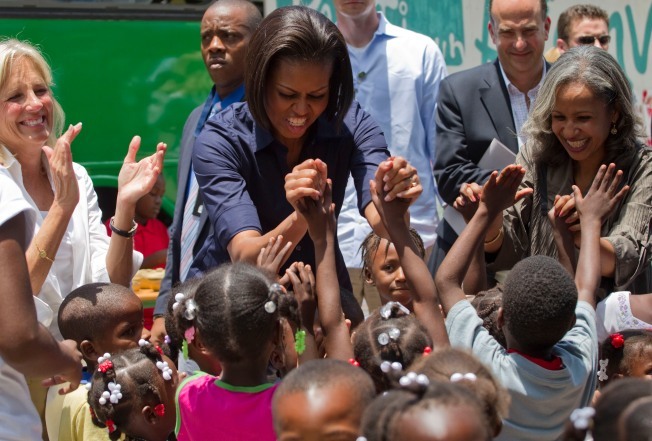 First lady Michelle Obama; Haiti's first lady, Elisabeth Debrosse; and Vice President Joseph Biden's wife, Jill Biden, greet children in Port-au-Prince in April. Haiti's first lady, Elisabeth Preval, is visiting Washington as paintings and drawings made by her nation's children after the earthquake go on view at the Smithsonian Institution. Art has provided healing for children as a way for them to express their emotions, Preval said. She wants the Washington exhibit to remind the world that Haiti still needs help. It opened Thursday on the National Mall. The display includes paintings by U.S. first lady Michelle Obama and Jill Biden, wife of Vice President Joe Biden, from their April visit to Port-au-Prince. At the direction of a 5-year-old boy, Obama painted a colorful fish and Biden painted a house. The Smithsonian also is leading a recovery project to pull paintings and cultural relics from Haiti's rubble to be preserved.